Oakland Lake Merritt to Bay Trail Connection receives Architizer A+ Awards Special Mention, 2017. American Tobacco Trail Bridge receives ACEC Engineering Excellence Award, 2014. 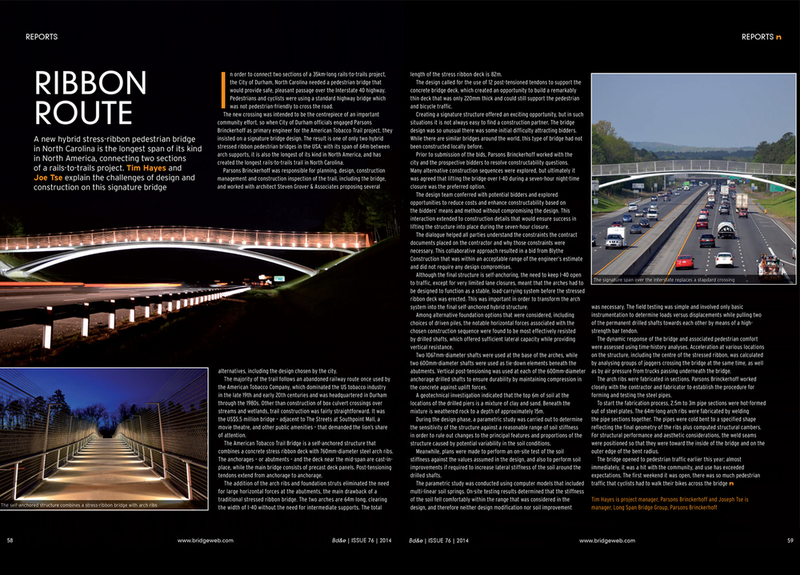 "Hybrid Stressed Ribbon Bridge Sets U.S. Record" Civil Engineering: The Magazine of the American Society of Civil Engineers. ASCE. August 05, 2014. "Ribbon Route" BD&E. Issue 76. 2014. "Best of California 2005 Awards: Homer Avenue Caltrain Undercrossing, Palo Alto" California Construction. 2005. Commendation from City of Berkeley, 1998. Commendation from Berkeley Water Front Commission, 1995. "Sound Wall" Berkeley Voice. 1997. "Berkeley Bridge Will Soar Over 1-80" SF Chronicle, 1997.